All of our titanium rings & titanium wedding rings are made from commercially pure titanium which is typically 98% - 99% pure. 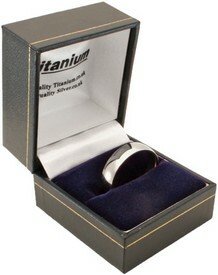 Titanium is a lustrous silver coloured metal with a very high strength to weight ratio. Titanium is 4 times stronger than steel, but with only half the weight makes it a very strong, lightweight material for jewellery. 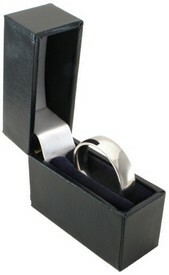 All of our titanium rings, and titanium wedding rings will carry our own unique titanium logo discreetly laser engraved inside the ring, and matching to our branded ring boxes. We have been selling titanium jewellery since 2003, and have never had a broken, or squashed titanium ring returned to us. Titanium unfortunately is not scratch proof as some websites will state, however it is far more scratch resistant than silver, gold, paladium, platinum or even steel. It is also possible to either re-polish, or re-texture a brushed finish should the need arise. If you are looking for a scratchproof wedding ring, then we would advise our tungsten carbide or cobalt rings which are more scratch resistant than titanium.